Attaches securely through center mount. Tough, long lasting aluminum oxide abrasive smooths surfaces and removes material and imperfections fast. Adaptable to all drills, for use on mounting buffing wheels. Carded. Superior grade of fine cotton sheeting held together with two or four circles of lockstitch sewing. Gives a resilient, cushioned effect when in use. Used for light cutting and coloring. Discs of soft flannel joined by two or four circles of lockstitch sewing. Follow intricate contours easily; will not scratch; gives the most brilliant finish of all buffs. Extra soft wheel is made of the finest combed flannel to create an extra soft nap. For use with rouge to color gold, silver, and other precious metals; All final coloring operations. Drawstrings reversible. Withstands multiple washings. Applications: Applying or removing wax. Use with random orbital polishing machines or backing pads. This complete kit contains 1 universal back up pad and 3 stick-on sanding discs. The 1/4" arbor is designed to fit any electric drill. Coarse cutting action. Sewn in a continuous spiral from the center to the face. Dependable, well-balanced, long wearing wheels for general shop use. Carefully selected, high-grade cotton sheeting assembled to give maximum cutting action. One inch hole size packaged with DICO toothed flanges for 1/2" spindle. Washable and reusable with drawstrings. Applications: Polishing wood, fiberglass, plastics and 1st stage automotive & marine buffing. Drawstrings reversible. Withstands multiple washings. Applications: Applying or removing wax. Use with random orbital polishing machines or backing pads. This complete kit contains 1 universal back up pad and 3 stick-on sanding discs. The 1/4" arbor is designed to fit any electric drill. Quick mount with 1/4" mandrel pressed into the buffs. 3/4" Cotton cushion sewn. For smaller buffing jobs; light cutting & for coloring smaller objects. Tie on Bonnets made of 100 percent lambs wool. Withstands multiple washings and chemicals. Used on heavily soiled surfaces for applying waxes, glazes & compound. Discs of soft flannel joined by two or four circles of lockstitch sewing. Follow intricate contours easily; will not scratch; gives the most brilliant finish of all buffs. Extra soft wheel is made of the finest combed flannel to create an extra soft nap. For use with rouge to color gold, silver, and other precious metals; All final coloring operations. Stripping and finishing pads. Stripping and finishing pads. Stripping and finishing pads. Made from lambs wool blends with synthetic backing. Available in various sizes and pile heights; can withstand multiple washings. Used for compounding and polishing of soiled surfaces. 1 1/8" pile. Carded Superior grade of fine cotton sheeting held together with two or four circles of lockstitch sewing. Gives a resilient, cushioned effect when in use. Used for light cutting and coloring. Tie on Bonnets made of 100 percent lambs wool. Withstands multiple washings and chemicals. Used on heavily soiled surfaces for applying waxes, glazes & compound. Adjust from low air to a full volume flow. Recommended air pressure to 150 PSI maximum. Knurled nozzle makes handling easy. Complete with handy pocket clip. Fits all Industrial/Milton Design 1/4" coupler bodies. Vented nozzle to relieve the compressed air should the nozzle become plugged or accidentally obstructed. Heavy duty die cast body. Hang up hook and 1/4" NPT female inlet included. Meets OSHA regulation 1001 for 30 PSI "dead head'' pressure. Inlet Pressure - 150 PSI. 5" Sanding disc kit for drills includes: (2) Ultra coarse/fast removal 40 grit pads, (2) coarse/removal 80 grit pads and (1) fine/final prep 120 grit pad. For use on wood, metal and plastics. Clog-Shield, Diablo's own blend of grinding agents, reduces loading, thus maximizing productivity. High-carbon steel cutting edge for general purpose wood cutting applications. Curved Tec blade design for greater control and smooth, precise plunge cuts. Color coded interface and laser etched blade to quickly identify the right blade. Starlock interface for professional performance, also works with OIS compatible tools including Bosch, Fein, Milwaukee, Makita, Rigid and others. Precision Swiss made blade for accuracy and long life. Aggressive flush cuts and plunge cuts in wood, plastic, drywall and other soft materials up to 1-9/16" deep. Beveled tooth design for maximum blade durability and versatility. Special design creates cleaner, more accurate flush cuts. For use with all brands of Multi-purpose oscillating tools. Rigid scraper blade for removal of vinyl flooring, bonded carpeting, old coats of varnish/paint and adhesives. Flexible scraper blade for removal of caulk, coats of peeling paint and soft adhesives. For use with all brands of multi-purpose oscillating tools. Safety blow gun. For plunge cuts and flush cuts in wood, plastic, drywall and other soft materials up to 1-9/16" deep. Use with all brands of multi-purpose oscillating tools. For removing old vinyl, wood or other floor coverings, paint and coatings, residues and separating laminated layers and cuts carpets. Universal fit system allow accessory to fit all major brand oscillating tools. For removing elastic sealants, paint adhesive residues, wallpaper, worn gaskets, etc. Cuts carpet, leather, linoleum and similar materials. Universal fit system allow accessory to fit all major brand oscillating tools. One piece pad/mandrel assembly attaches easily to standard household drill (1/4", 3/8", 1/2") for removing paint from wood and metal surfaces. Features Scotch-Brite abrasive web that will not rust or splinter like wire brushes. Conforms to surface contours and reduces gouging. Use 2-disc on 1 mandrel, or double-wide for longer, tougher jobs. Removes paint and varnish from contoured surfaces. Mounts directly to power drills by inserting the mandrel into a drill chuck. Fits: All Household Drills. Applications: Removing Paints, Varnishes, Rust; Sanding, Polishing & Buffing. 1/4" shaft. For removal of stubborn caulk, paint, adhesive residue, tile adhesive and window putty. For sawing. Detailed plunge cuts up to 1-5/8" depth in non-metal materials. High-Carbon steel. 16 teeth per inch. Coarse cutting action. Sewn in a continuous spiral from the center to the face. Dependable, well-balanced, long wearing wheels for general shop use. Carefully selected, high-grade cotton sheeting assembled to give maximum cutting action. One inch hole size packaged with DICO toothed flanges for 1/2" spindle. For removing deep penetrating adhesive, caulking, silicone and other soft bonding materials up to 3" deep. For use with all brands of Multi-Purpose oscillating tools. Fits electric drills. For removing surface defects on metal, wood, plastic and fiberglass. For stripping paint and primers. The open-webbed, semi-flexible design of this wheel makes it easy to strip edges, contours and even surface without gouging. Silicon carbide grain is uniformly distributed throughout the wheel, allowing for aggressive removal of paint and rust. Tie on Bonnets made of 100 percent lambs wool. Withstands multiple washings and chemicals. Used on heavily soiled surfaces for applying waxes, glazes & compound. Converts any standard ball foot tire chucks to a safety blowgun. Vented nozzle and built-in pressure reduces limit nozzle pressure to a maximum of 30 PSI, with up to 150 PSI inlet pressure. Conforms to No.1001 OSHA regulation. Epoxy finish. Die-cast body. 1/4" air inlet. Oil resistant, soft replaceable rubber tip. Will not mar delicate surfaces. Ideal for leak proof seal against oil passages, fuel lines and carburetors when air pressure is needed for cleaning. Allows full line pressure to be used. Includes 1/4" female NPT inlet. To comply with OSHA regulations standard blowguns must be used on a regulated air line with a pressure setting not to exceed 30 PSI. Cotton buffing wheel with 1/2" (12.7mm) arbor hole. 6" x 1/2" x 55 ply. Spiral sewn stitches every 3/8" (9.52mm). 1/2" (12.7mm) face width. 3,600 maximum rpm. For use on all 6" (152.4mm) buffing and grinding machines. Large area removal of harder materials such as vinyl flooring and bonded carpeting or scraping off coats of paint, varnish or adhesives. Blade is 5.5"x3.9". Use with 122.5929. Removes paint and varnish from contoured surfaces. Mounts directly to power drills by inserting the mandrel into a drill chuck. Fits: All Household Drills. Applications: Removing Paints, Varnishes, Rust; Sanding, Polishing & Buffing. 1/4" shaft. For sawing. Japanese teeth for precision cutting in hardwoods up to 1-5/8" depth. High-Carbon steel. 14 teeth per inch. Tackle tough scraping applications with Dewalt oscillating scraping blades. Crafted from steel for long life and durability. Each blade is compatible with all major oscillating tool brands. Power brushless motor provides 5200 rpm maintaining speed under load. Flexible mushroom style head for light material removal such as paint and rust. 7-1/4" capacity blade provides 2-9/16" cutting capacity at 90 degrees. Tackle tough scraping applications with the Dewalt oscillating scraper blade. Crafted from steel for long life and durability. Each blade is compatible with all major oscillating tool brands. Power brushless motor provides 5200 rpm maintaining speed under load. Rigid body for long life. 7-1/4" capacity blade provides 2-9/16" cutting capacity at 90 degrees. Universal fit. Serrated edges for easy material removal. Diameter: 0.73". Size: 3". Thickness: 0.73". For removing sealant, paint and glue. High-carbon steel edge for removing tough sealants, adhesives and paint. Rigid design for scraping applications. Color coded interface and laser etched blade to quickly identify the right blade. Starlock interface for professional performance. Also works with OIS compatible tools including Bosch, Fein, Milwaukee, Makita, Rigid and others. Precision Swiss made blade. Blade thickness: 0.125"; Blade Length: 4.0". Mandrel mounted. Can be mounted on any 3/8" drill. Gives a high gloss finish. Withstands multiple washings. Applications: Final Polish & Waxing. 5-1/2". Boxed. With carbide edging for aggressive material removal, Dewalt oscillating grout removal blades are compatible with all major oscillating tool brands. No adapter required. Universal fit for use on all major brands. Diamond grit for fast cuts in tough applications. Diameter: 0.73". Size: 3". Thickness: 0.73". For sawing. Japanese teeth for precision cutting in hardwoods up to 1-5/8" depth. High-Carbon steel. 14 teeth per inch. For sawing. General purpose plunge cuts up to 2-5/8" depth in non-metal materials. High-Carbon steel. 15 teeth per inch. 3/8", 3/4" and 1-1/4" flush cut (e-cut) blades for plunge cuts and flush cuts in wood, plastic, drywall and other soft materials up to 1-9/16" deep. For use with all brands of multi-purpose oscillating tools. Comfortable thumb lever valve control with handy hanger in lever and hanger hook. Compact one piece nozzle. Allows full line pressure to be used. Includes 1/4" female NPT inlet. To comply with OSHA regulations standard blowguns must be used on a regulated air line with a pressure setting not to exceed 30 PSI. For linear and plunge cutting. Use on thin wood, plastic, fiberglass, non-ferrous metals, thin sheet metal, hardened fillers and window glazing. Semicircle. Universal fit system allow accessory to fit all major brand oscillating tools. Interchangeable nozzles for cleaning and inflating. Complies with OSHA regulations standard blowguns must be used on a regulated air line with a pressure setting not to exceed 30 PSI. Includes: standard nozzle, tapered inflator nozzle and ball inflator nozzle. For sawing. Titanium enhanced Bi-metal for longer life cutting in wood with nail applications. 1-5/8" plunge depth. 18 teeth per inch. Double-edged blade cannot be resharpened. Resists fractures from accidental nail and staple strikes. For use with Nos.1594, 1594K, 3365 (SKU 621.9976) 3-1/4" planer, 53514, 53518. Use for flush cutting doorjamb or windowsill, flooring or tile installation, or squaring off rounded corners. High-carbon steel blade for precision wood cutting. May be used on wood, plastic, drywall and other soft materials. 1-11/16" depth of cut. Universal fit for adapter free use with all major oscillating tool brands. Durable enough to tackle tough jobs. Easily cut through wood with this oscillating fast cut wood blade. Includes 2 washers. Length: 1-3/4". Size: 1-1/4". Thickness: 0.75". The fast cutting drywall jab saw offers the ideal solution for cutting drywall with your Multi-Max oscillating tool. Designed to make both straight and curved cuts, the jab saw's offset design and sharpened tip allow plunge cutting with not pilot hole needed. Cuts around electrical boxes and recessed lighting quickly and easily. 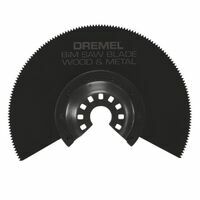 The blade is newly designed, utilizing Dremel's Universal quick fit interface for compatibility with most oscillating tools. For coarse grinding or rasping and aggressive material removal in small tight areas. Use on wood, hardened adhesives, thin set and masonry. 2.5" Carbide grit finger shaped. Universal fit system allow accessory to fit all major brand oscillating tools. With carbide edging for aggressive material removal, Dewalt oscillating grout removal blades are compatible with all major oscillating tool brands. No adapter required. Universal fit. Carbide edging for grout removal. Diamond grit for fast cuts in tough applications. Diameter: 0.7". Size: 3". Thickness: 0.7". For aggressive material removal of wood, tile adhesives, cement and mortar. For use with all brands of Multi-Purpose oscillating tools. Kit is used to turn a drill into a sander; for use on wood, metal, and plastic. Includes: 5" disc pad and (3) sanding discs one each: 40, 80 and 120 grit. For sawing. Titanium enhanced Bi-metal for longer life cutting in metal and wood applications. 2-1/8" plunge depth. 18 teeth per inch. For sawing. Titanium enhanced Bi-metal for longer life cutting in wood with nail applications. 1-5/8" plunge depth. 18 teeth per inch. Sharpening on both sides allows reversal for longer life. For use with No. DW675K Planer. Reversible carbide straight blades that can be sharpened on both sides for longer life. For use with DW677K, DW680K or DW678K planers. Ideal for cutting wood with nails. Universal fit for use on all major brands (no adapter required). Light-weight aluminum body with OSHA compliant safety nozzle. 40 CFM For cutting wood, wood with nails, drywall, pvc, metal (nails and staples). Bi-metal cutting edge for all-purpose applications including wood with nails. Curved Tec blade design for greater control and smooth, precise plunge cuts. Color coded interface and laser etched blade to quickly identify the right blade. Starlock interface for professional performance, also works with OIS compatible tools including Bosch, Fein, Milwaukee, Makita, Rigid and others. Precision Swiss made blade. Blade thickness: 0.125". For sawing. Plunge cutting up to 1-5/8" depth. Bi-metal with hardened, titanium-coated teeth for longevity. 18 teeth per inch. Combination of a blowgun and the siphon spray nozzle. Barbed siphon inlet fits 1/4 inch ID hose or tubing. Use for spray- cleaning engines, applying protective coating, etc. Allows full line pressure to be used. Includes 1/4" female NPT inlet. To comply with OSHA regulations standard blowguns must be used on a regulated air line with a pressure setting not to exceed 30 PSI. Bi-metal with wavy universal toothing. Broad application spectrum for sheet metal up to 1/16", aluminum profile, copper pipes, wood, plasterboard and plastics. Wide, waisted shape for optimal cutting speed and good swarf removal. High carbon steel cutting edge for general purpose wood applications. Curved Tec blade design for greater control and smooth, precise plunge cuts. Color coded interface and laser etched blade to quickly identify the right blade. Starlock interface for professional performance. Also works with OIS compatible tools including Bosch, Fein, Milwaukee, Makita, Rigid and others. Precision Swiss made blade. Blade thickness: 0.125"; Blade size: 1-1/4". For cutting wood, hardwood and laminate. Bosch Saw Blade, Flush Cut, Suitable For Use With: 6300, 8300, MM20 and MM40 Oscillating Tools, 7/8 in Size, Bi-Metal, 3.9 in Length, For Cutting Openings in Wood and Metal, Flooring for Venting, Repairing Damaged Flooring and Cutting Openings for Electrical Boxes, Window Restoration to Remove Glazing For coarse grinding or rasping and aggressive material removal over larger areas. Use on wood, hardened adhesives, thin set and masonry. Triangular carbide grit. Universal fit system allow accessory to fit all major brand oscillating tools. Flush cut saw blade for oscillating multi-tool. Used for faster and larger cuts. The 4" width and 270 degree cutting surface provides a larger cutting area. This high carbon steel blade will cut multiple materials such as pvc, wood and drywall. The tool free fit allows users to change accessories quickly. Hook and loop system holds disc securely, fits all standard household drills and is reusable; Used for paint, wood, and metal. Includes: 3M Hookit disc pad, 3M Hookit sanding discs. For plunge cuts and flush cuts in nails, nail-embedded wood, copper, aluminum, other non-ferrous metals, mild steel, wood, plastic, drywall and other soft materials up to 2-1/4" deep. 5 times the durability of regular bi-metal blades. For use with all brands of Multi-Purpose oscillating tools. Oscillating saw blade. Universal fit system adapts to other brands. 3-1/8" carbide grit for oscillating tools. Use to remove grout, porous concrete and masonry. Semi-circle shape with flat side allow for easy access into corners and flush against adjoining surfaces. Bi-metal with wavy universal toothing. Broad application spectrum for sheet metal up to 1/16", aluminum profile, copper pipes, wood, plasterboard and plastics. Wide, waisted shape for optimal cutting speed and good swarf removal. Set teeth for all woods, plasterboard and plastic materials, very clean cuts and good cutting speed. Medium width, waisted shape for optimal cutting speed and good swarf removal. 1-3/8" width x 2" length. Cuts through a large variety of materials. Quick Fit interface allows for capability with most oscillating tool brands. Includes: 1-1/4" Wood and Metal Flush cut blade, 1-1/4" Wood Flush Cut blade and 3" Wood and Drywall blade. Premium carbide teeth for long life in tough applications. Featuring Universal Fitment for adapter free use with all major oscillating tool brands. Durable for tough jobs. Diamond grit for long life. Applicable Materials: Hardwood with nail. Thickness: 3/4". Black/Titanium Coated Finish. Premium carbide teeth for long life in tough applications. Featuring Universal Fitment for adapter free use with all major oscillating tool brands. Durable enough to tackle tough jobs. Diamond grit for long life. Applicable materials: Hardwood with nails. Black finish. Thickness: 0.7". For cutting wood, wood with nails, drywall, pvc, metal (nails and staples). Bi-metal cutting edge for all-purpose applications including wood with nails. Curved Tec blade design for greater control and smooth, precise plunge cuts. Color coded interface and laser etched blade to quickly identify the right blade. Starlock interface for professional performance, also works with OIS compatible tools including Bosch, Fein, Milwaukee, Makita, Rigid and others. Precision Swiss made blade. Blade Thickness: 0.125"; Blade Length: 4.0". High speed oscillating tool blade. For slicing, ripping, or scraping soft materials and hardened adhesives. Universal accessory fits all tools. Fast wood cutting oscillating blade. Universal fit is compatible with Fein, Bosch, Dremel, Rockwell, Porter-Cable and other brands. Flush cutting blade with high performance carbide teeth for longer life. Users can cut hardwoods, nails, screws, stainless steel bolts, galvanized pipe, plaster and lathe, cement board, fiber board, sheet metal, slate, ceramic tile and more. It's wide 1-1/4" blade speeds through long cuts and can make plunge cuts up to 1-11/16" deep. Universal Quick Fit system allows this blade to fit nearly every oscillating tool on the market. Die cast body and dial type gauge with rubber protector. Fitted with single clip-on connector. Air pressure: 0-220 PSI. Air inlet: 1/4'' NPT. Bi-metal blade with xtra-clean cutting edge for clean cuts in hard wood, cutting wood and laminate. Curved Tec blade design for greater control and smooth, precise plunge cuts. Color coded interface and laser etched blade to quickly identify the right blade. Starlock interface for professional performance. Also works with OIS compatible tools including Bosch, Fein, Milwaukee, Makita, Rigid and others. Precision Swiss made blade. Blade Thickness: 0.125". Blade Length: 4.0" Double-row Japanese toothing for all wood materials, plasterboard and soft plastics. For fast work progress and maximum precision. Extra wide shape for maximum cutting performance and long straight cuts. General purpose use bi-metal oscillating blade. Titanium coated for long life. Compatible with Fein, Bosch, Dremel, Rockwell, Porter-Cable and other brands. Set teeth for all woods, plasterboard and plastic materials. Very clean cuts and good cutting speed. Wide shape for maximum performance and long straight cuts. 2-9/16" width x 2" length. For cutting iron bar, black pipe, metal (nails and staples), wood with nails, drywall and ceramic. Carbide teeth for high performance in metal and other materials. Color coded interface and laser etched blade to quickly identify the right blade. Starlock interface for professional performance, also works with OIS compatible tools including Bosch, Fein, Milwaukee, Makita, Rigid and others. Precision Swiss made blade. Blade thickness: 0.125". Grout blade is is able to remove all grout up to the surface of a wall or corner in repair, remodeling and restoration work. Blade is 2-1/2". Use with 122.5929. Grout blade is is able to remove all grout up to the surface of a wall or corner in repair, remodeling and restoration work. Blade is 2-1/2". Use with 122.5929. Bi-metal material for increased life. Universal fit for use on all major brands (no adapter required). For sawing. Ideal for hard to reach applications such as cabinet toe kicks to remove flooring. 1" cutting depth. Bi-Metal Material. Solid HSS saw blade with metal toothing for sheet metal up to approximately 1/16". Also for plastics, wood, glazing, compound, brass and bronze. Clean, narrow cutting line. Ideal cutting speed. Segmented, for working in corners and on edges without over cut. 3-3/8" blade diameter. For general purpose plunge cutting up to 1-5/8" depth in non-metal materials like wood, plastic and drywall. Universal fit system allow accessory to fit all major brand oscillating tools. Blade width - 1-3/8". For cutting iron bar, black pipe, metal (nails and staples), wood with nails, drywall and ceramic. Carbide teeth for high performance in metal and other materials. Color coded interface and laser etched blade to quickly identify the right blade. Starlock interface for professional performance, also works with OIS compatible tools including Bosch, Fein, Milwaukee, Makita, Rigid and others. Precision Swiss made blade. Blade thickness: 0.125". For linear, plunge and flush cuts in a variety of materials such as thin wood, plastic, drywall, fiberglass, non-ferrous metals, thin sheet metal, hardened fillers and window glazing. Bi-metal with hardened teeth to cut non-ferrous metals. Universal accessory fits all tools. For removing grout, cutting and shaping plaster, porous concrete and masonry. For course grinding or rasping for aggressive material removal over larger areas. Universal accessory fits all tools. 3-1/8" Carbide grit semicircle grout removal and rasp. Resharpenable; for use with Dewalt, DW680K and Makita, N1900 planers only. For coarse grinding of filler material, tile adhesive, concrete, stone and wood. Triangular shape, 3-1/8" edge length. Perforated. Can also be used with dust extraction. Bi-metal oscillating blade general purpose blade. Titanium coated for long life. Universal fit compatible with Fein, Bosch, Dremel, Rockwell, Porter-Cable and other brands. Diamond coated semicircle saw blade. For removing grout, cutting and shaping plaster, porous concrete and masonry, scoring and cutting for precise fit. Universal fit system allow accessory to fit all major brand oscillating tools. Premium carbide teeth for long life in tough applications. Featuring Universal Fitment for adapter free use with all major oscillating tool brands. Durable enough to tackle tough jobs. Diamond grit for long life. Plunge cuts through plaster, light brick and grout. Thickness: 0.7". For plunge cutting up to 1-5/8" depth on wood, plastic, fiberglass, nails, non-ferrous metals, thin sheet metal and hardened fillers. Universal fit system allow accessory to fit all major brand oscillating tools. For plunge cutting up to 1-5/8" depth on wood, plastic, fiberglass, nails, non-ferrous metals, thin sheet metal and hardened fillers. Universal fit system allow accessory to fit all major brand oscillating tools. Precision-ground, beveled tooth design allows for aggressive plunge cutting up to 1-5/8" depth on wood and soft plastics. Carbide oscillating blade for fast grout removal. Compatible with Fein, Bosch, Dremel, Rockwell, Porter-Cable and other brands. The ideal solution for cutting flexible materials with your Multi-Max oscillating tool. Designed to cut when being pulled or pushed. Unique, hooked blade design allows one-handed cutting. Makes quick cuts in a variety of material. Makes cuts in difficult to cut, flexible materials. Use on carpet, vinyl flooring, asphalt roofing shingles, cardboard, foam insulation and plastic. Selection of the 3 most popular Fein E-Cut saw blades for universal use. Ready for any sawing job. Combo includes: (1) E-Cut long life saw blade 1-3/8" and 2-9/16" wide and (1) E -Cut universal saw blade 1-3/4" wide. Carbide oscillating rasp for mortar and grout removal. Universal fit compatible with Fein, Bosch, Dremel, Rockwell, Porter-Cable and other brands. For long, straight cuts and cutting out installed parquet, laminate flooring and wall paneling. High-Speed steel. 12 teeth per inch. For sawing. Titanium enhanced Bi-metal for longer life cutting in wood with nail applications. 1-5/8" plunge depth. 18 teeth per inch. For sawing. Japanese teeth for precision cutting in hardwoods up to 1-5/8" depth. High-Carbon steel. 14 teeth per inch. For sawing. General purpose plunge cuts up to 2-5/8" depth in non-metal materials. High-Carbon steel. 15 teeth per inch. Oscillating blade assortment. Universal fit compatible with Fein, Bosch, Dremel, Rockwell, Porter-Cable and other brands. For an ultra smooth finish of drywall compound. Anti-clog coating on disc decreases loading and promotes optimal dust collection. Fits Orgill SKU# 3310117. For an ultra smooth finish of drywall compound. Anti-clog coating on disc decreases loading and promotes optimal dust collection. Fits Orgill SKU# 3310117. For an ultra smooth finish of drywall compound. Anti-clog coating on disc decreases loading and promotes optimal dust collection. Fits Orgill SKU# 3310117. For cutting wood, wood with nails, drywall, pvc, metal (nails and staples). Bi-metal cutting edge for all-purpose applications including wood with nails. Curved Tec blade design for greater control and smooth, precise plunge cuts. Color coded interface and laser etched blade to quickly identify the right blade. Starlock interface for professional performance, also works with OIS compatible tools including Bosch, Fein, Milwaukee, Makita, Rigid and others. Precision Swiss made blade. Blade thickness: 0.125". Flush cutting blade with high performance carbide teeth for longer life. Users can cut hardwoods, nails, screws, stainless steel bolts, galvanized pipe, plaster and lathe, cement board, fiber board, sheet metal, slate, ceramic tile and more. It's wide 1-1/4" blade speeds through long cuts and can make plunge cuts up to 1-11/16" deep. Universal Quick Fit system allows this blade to fit nearly every oscillating tool on the market. For an ultra smooth finish of drywall compound. Anti-clog coating on disc decreases loading and promotes optimal dust collection. Fits Orgill SKU# 3310117. For an ultra smooth finish of drywall compound. Anti-clog coating on disc decreases loading and promotes optimal dust collection. Fits Orgill SKU# 3310117. For sawing. Plunge cutting up to 1-5/8" depth. Bi-metal with hardened, titanium-coated teeth for longevity. 18 teeth per inch. Bi-metal blade with xtra-clean cutting edge for clean cuts in hard wood, cutting wood and laminate. Curved Tec blade design for greater control and smooth, precise plunge cuts. Color coded interface and laser etched blade to quickly identify the right blade. Starlock interface for professional performance. Also works with OIS compatible tools including Bosch, Fein, Milwaukee, Makita, Rigid and others. Precision Swiss made blade. Blade Thickness: 0.125". Blade Length: 4.0" For removal of defective tile grout. Also for cutting slots in plaster, porous concrete and similar construction materials and for cleaning and reworking planked deck joints. Not suitable for very hard epoxy or cement grouts. The economical alternative to diamond blades. Ideal for working in corners and on edges without over cut. Kerf approximately 3/32". For grout removal and thinset removal. Premium carbide grit coating for long life in grout and tile applications. Hybrid teardrop design for use in both grinding and rasping. Color coded interface and laser etched blade to quickly identify the right blade. Starlock interface for professional performance. Also works with OIS compatible tools including Bosch, Fein, Milwaukee, Makita, Rigid and others. Precision Swiss made blade. Blade thickness: 0.125"; Blade length: 2.75". Double-row Japanese toothing for all wood materials, plasterboard and soft plastics. For fast work progress and maximum precision. Extra wide shape for maximum cutting performance and long straight cuts. Bi-metal with teeth set for all woods, plasterboard and plastic materials. Very clean cut and excellent work progress. Medium width, waisted shape for optimal cutting speed and good swarf removal. 1-3/8" Width x 2" Length. Extremely robust, unaffected by nails in wood (up to approximately 3/16" diam. ), masonry, etc. Premium carbide teeth for long life in tough applications. Featuring Universal Fitment for adapter free use with all major oscillating tool brands. Durable enough to tackle tough jobs. Diamond grit for long life. Applicable materials: Wood and trim. Black finish. Thickness: 0.7". Double-row Japanese toothing for all wood materials, plasterboard and soft plastics. For fast work progress and maximum precision. Extra wide shape for maximum cutting performance and long straight cuts. Premium carbide teeth for long life in tough applications. Featuring Universal Fitment for adapter free use in all major oscillating tool brands. Durable enough to tackle tough jobs. Diamond grit for long life. Black finish. Thickness: 0.7". Applicable materials: Wood and mold. Foam pad with abrasive disc attached, used with No.7800 drywall sander (SKU 673.6730), 80 grit textured paint removal, wallpaper paste removal, 100 grit fast sanding and smoothing, 120 grit all-purpose applications, 150 grit final sanding and smoothing, 180 grit lightweight quick-dry drywall sanding and smoothing, paint conditioning, 220 grit light-weight quick-dry drywall sanding and smoothing, paint conditioning. Foam pad with abrasive disc attached, used with No.7800 drywall sander (SKU 673.6730), 80 grit textured paint removal, wallpaper paste removal, 100 grit fast sanding and smoothing, 120 grit all-purpose applications, 150 grit final sanding and smoothing, 180 grit lightweight quick-dry drywall sanding and smoothing, paint conditioning, 220 grit light-weight quick-dry drywall sanding and smoothing, paint conditioning. Foam pad with abrasive disc attached, used with No.7800 drywall sander (SKU 673.6730), 80 grit textured paint removal, wallpaper paste removal, 100 grit fast sanding and smoothing, 120 grit all-purpose applications, 150 grit final sanding and smoothing, 180 grit lightweight quick-dry drywall sanding and smoothing, paint conditioning, 220 grit light-weight quick-dry drywall sanding and smoothing, paint conditioning. Resharpenable knives made of M2 laminated high speed tool steel. Easy knife changes. Fits No. DW733 planer. Disposable, reversible thickness planer knives made of M2 laminated tool steel that stays sharper and lasts longer than conventional tool steel, machined locator holes help users align knives on cutter-head during knife change. Carbide teeth for high performance in metal and other materials. Color coded interface and laser etched blade to quickly identify the right blade. Starlock interface for professional performance. Also works with OIS compatible tools including Bosch, Fein, Milwaukee, Makita, Rigid and others. Precision Swiss made blade. 5 piece set includes 1 of each: OSL114C, OSL114JF, OSL114F, OSL200RS AND OSL312F. With carbide edging for aggressive material removal, Dewalt oscillating grout removal blades are compatible with all major oscillating tool brands. No adapter required. Long life in material removal applications. Power brushless motor provides 5200 rpm maintaining speed under load. Diamond grit for fast cuts in tough applications. 7-1/4" capacity blade provides 2-9/16" cutting capacity at 90 degrees. Disposable, reversible thickness planer knives made of M2 laminated tool steel that stays sharper and lasts longer than conventional tool steel, machined locator holes help users align knives on cutter-head during knife change. Replacement blades, 2-side edge.